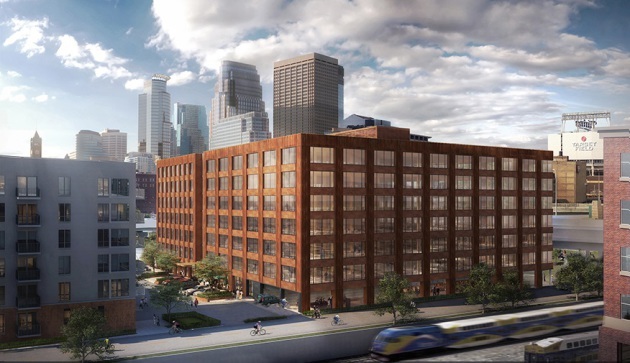 If an old brick and timber warehouse and a state-of-the-art technology center had a baby, it would look a lot like T3, a new office structure under construction in Minneapolis. International real estate developer Hines is giving the City of Lakes several "firsts" with its 220,000-square-foot building in the North Loop neighborhood, including the first commercial property in the U.S. -- let alone in Minneapolis -- to use an engineered wood material used for its interior and exterior. Now, Hines says its 7-story T3 will be the first office building in Minneapolis to receive preliminary Wired Certification, a standard that identifies best-in-class buildings for Internet connectivity, an ever-increasing prerequisite for tenants seeking office space. Hines is banking on this certification, and other building features, to land tenants for the project that is being built without any signed leases. "Strong Internet connectivity is becoming increasingly critical to the day-to-day operations of any business," said Arie Barendrecht, chief executive and co-founder of WiredScore, in a release. "T3's Wired pre-certification ensures that tenants will have access to a well-planned, fully redundant and resilient technological infrastructure that will promote seamless connectivity from the moment they sign a lease and for many years to come." T3's name is meant to represent the three unique attributes of the building: timber, transit and technology. And while much attention has been given to its timber material and obvious location near lightrail, the means for fulfilling the third element wasn't clear until Tuesday's announcement. Since its inception, T3 has been marketed to firms looking for the charm of antiquated, loft-style architecture, but with all the modern amenities needed to conduct business in the modern age. Being new construction, T3 is poised to hold an advantage over some retrofitted warehouses where IT connectivity is less reliable or reinforced. "Pursuing and securing preliminary WiredScore pre-certification is a testment to how seriously we take IT performance and security," said Steve Luthman, Hines' managing director. "Reliable IT infrastructure is a must for the progressive office user and has become especially critical for growing firms in the technology industry."